You love books, right? You want to be surrounded by them. Maybe you even want to decorate with them and show off your bibliophilia however you can. Amen to that. And maybe you’re crafty or artsy as well as an avid reader. Now you can make those decorations yourself. Awesome. Well, even if you’re not crafty, there’s always Etsy, right? But where do you draw the line with book decorations? 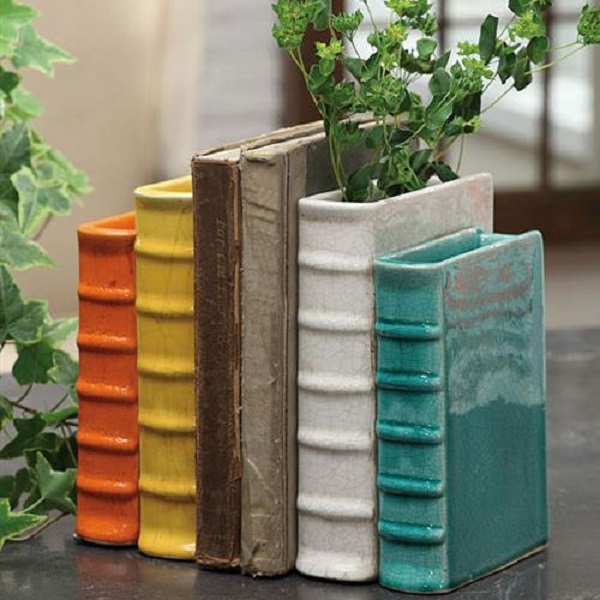 You can find literal bookshelves, book purses and clutches, and even book planters. As creative as these items are, I squirm when I see them. Why? Because these kinds of crafts and decorations require the sacrifice of an actual book, meaning it will never be read again. Their pages have to be carved out to make room for dirt . . . in the case of the book planters anyway. 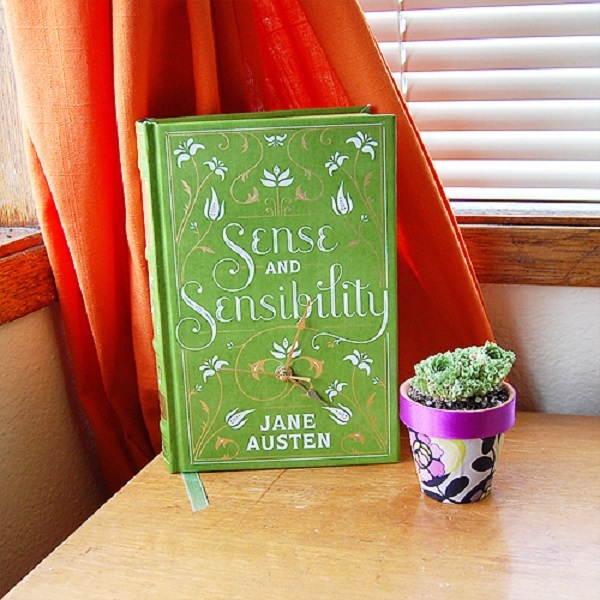 And oftentimes the books crafters use are truly amazing classics, like this beautiful copy of Sense and Sensibility turned into a clock. Austen’s words have been sliced out with an X-acto knife for a clock you can barely even see! Oh, the horror! Often older editions, particularly first editions, are falling apart, but they are still part of history. Think about it: if old editions of books are used for crafting, a hundred years from now we won’t have them anymore. Books, particularly those 50 years and older, have a story not only within its pages but also in its own existence. I fully acknowledge that using books as crafting material doesn’t come close to burning a book, but it still “kills” a book. 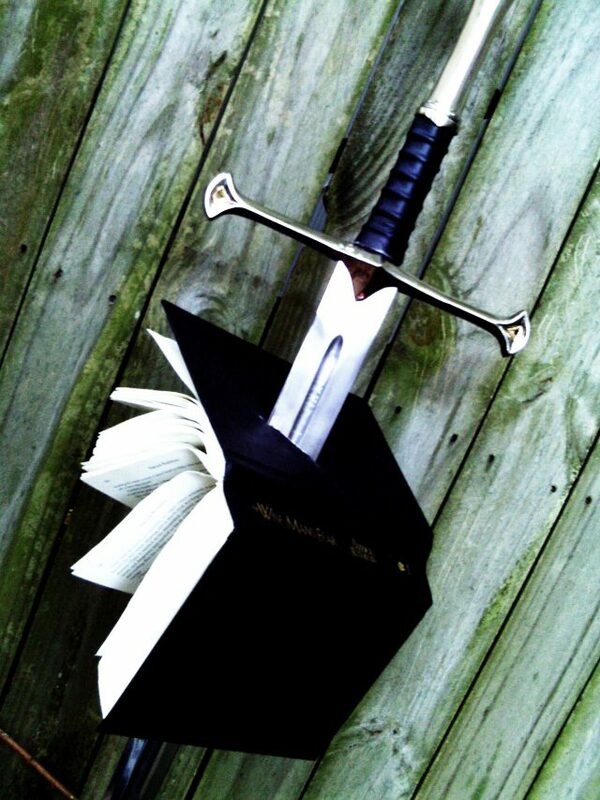 And I should think true bibliophiles would hate to destroy a book simply for decoration. Stop the bibliocide, people! Okay, my drama queen moment is over. On to the positive part of this post. You can still be crafty without harming a book. You can print out text onto printer paper, use books as they are, or not even use books at all. 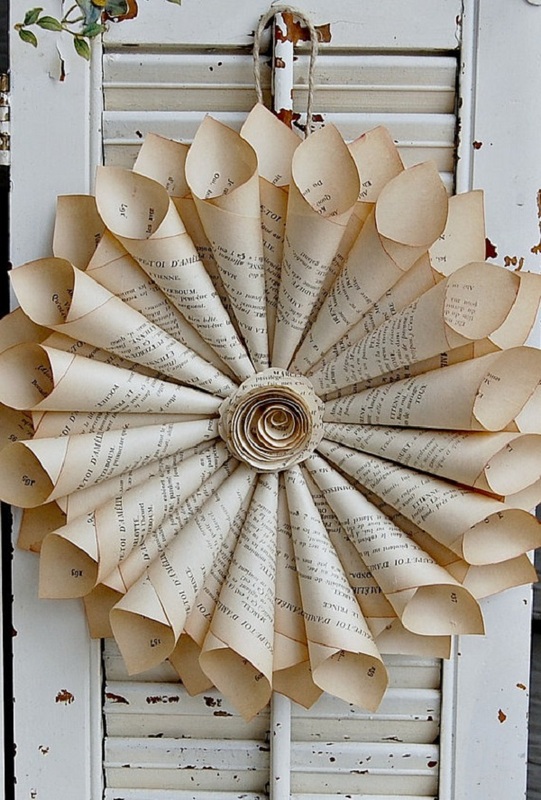 Here are some of these safe, crafty book decorations. These would look lovely in a vase or in a bouquet for a wedding. Perfect for book lovers! Bring all your favorite fantasy worlds together in your home with this sign post. Although the paper here seems to be taken from a book, you could use an ebook and print pages on card stock. 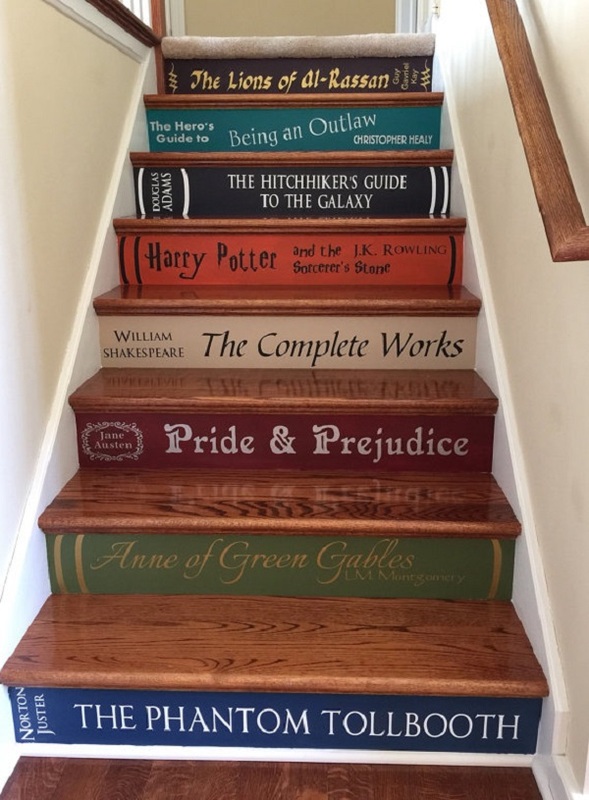 These decals allow you to decorate your stairs using your favorite book titles. You can, of course, customize the titles you order. 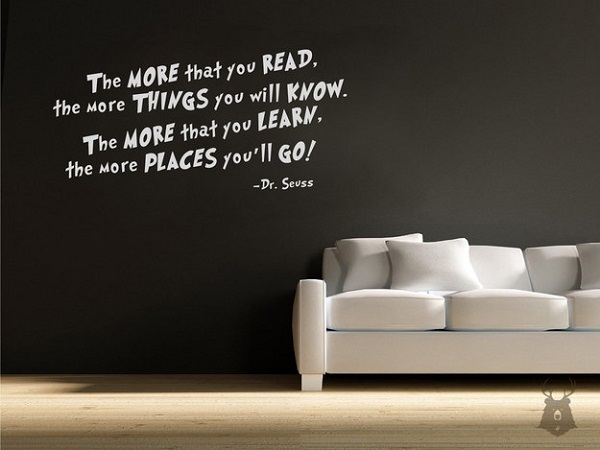 Why not use your favorite book quotes to occupy that unused wall space next to your bookshelves? If you simply must have a plant growing out of a book, just use these. Just in the time for the holidays. 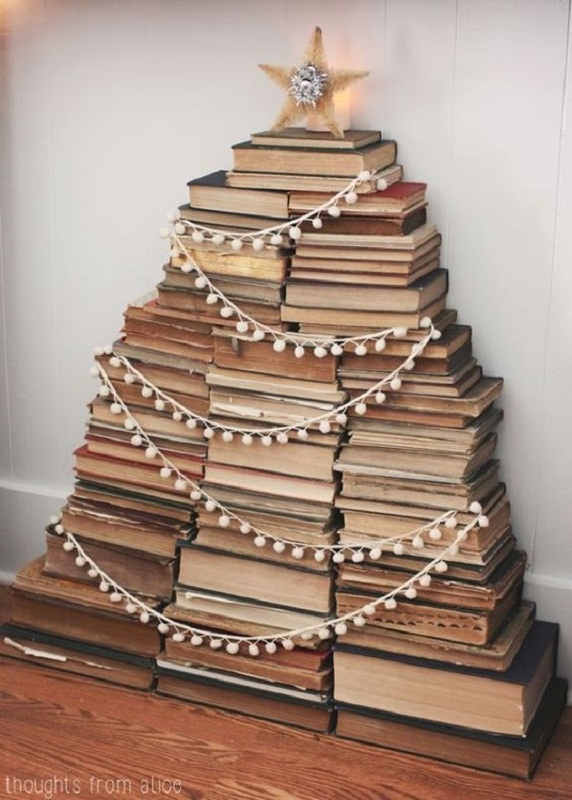 If you don’t want to buy a tree–or put your books away–stack your books into tree shape. No crafting required. 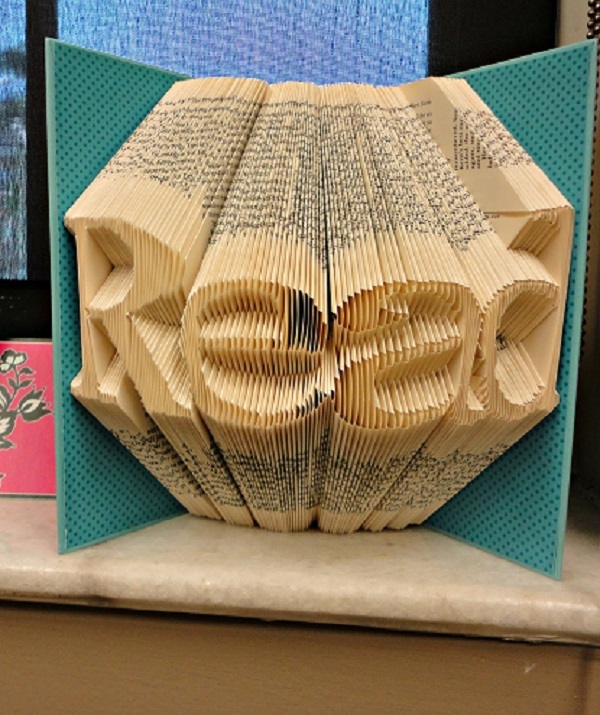 Here‘s a craft that actually saves a book! You don’t have to throw away your books that are falling apart. You can restore them! 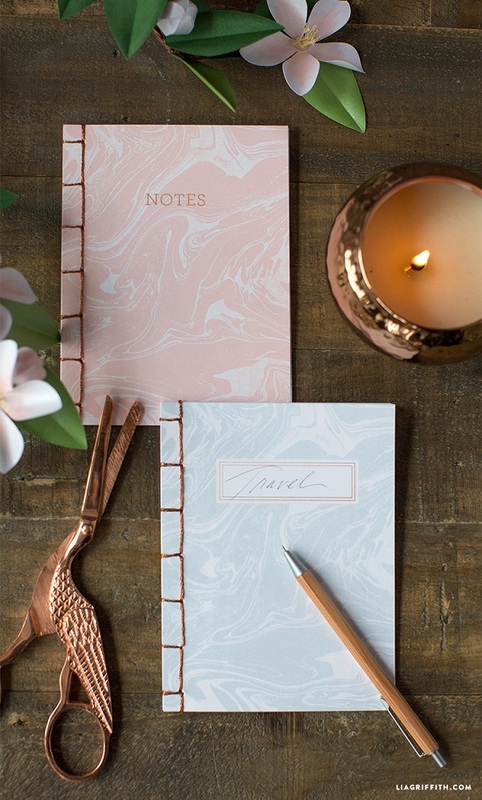 And you can bind a homemade journal. 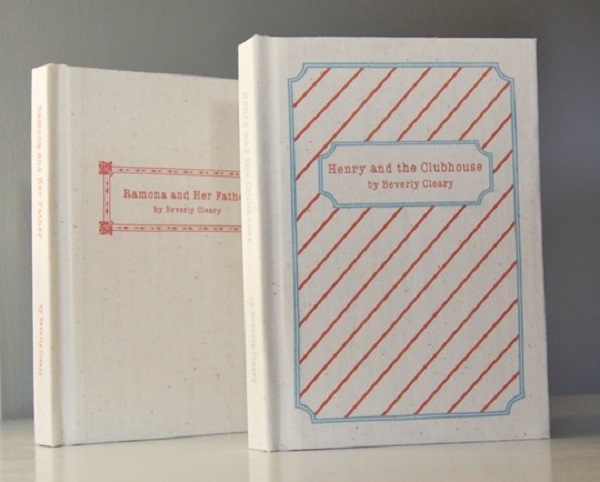 For a more complex, but really cool looking journal bookbinding experience, try this tutorial. I’ve actually done this one. It took me about 6 hours, but I did it! What are your favorite book crafts that don’t require a book to make?